Various factors that modulate the differentiation of malignant cells are known to affect their experimental metastatic potential (EMP), or lung colonization after intravenous injection into syngeneic animals. 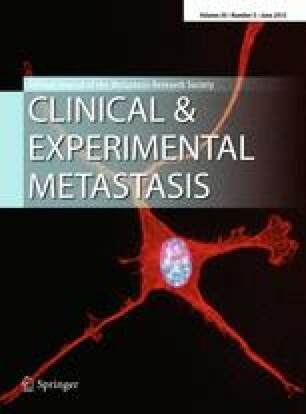 However, some results and conclusions on the relation between cell differentiation and metastasis have appeared to conflict. We have reanalysed this by measurement of EMP of B16 melanoma sublines after culture with agents or conditions that acted on differentiation through various intracellular pathways. All tested agents did affect the EMP. EMP was usually positively correlated with differentiation under diverse conditions, but exceptions showed that there is no direct causal connection. Nor could all findings be explained in terms of cell proliferation or expression of major histocompatibility antigens. Some data helped to explain disparities between previous reports. Specific novel findings included the following. The stimulation of EMP by melanocyte-stimulating hormone (MSH) as well as all other tested effects of MSH were prevented by extended exposure to 12-O-tetradecanoyl phorbol acetate (TPA), suggesting a requirement for protein kinase C activity as well as G-protein coupling in MSH action. Cells grown with cholera toxin were always more differentiated than untreated cells, but the EMP could be either markedly increased or markedly decreased by cholera toxin under different conditions. The basic culture medium apparently determined this striking reversal. The EMP was also significantly affected by the extracellular pH.